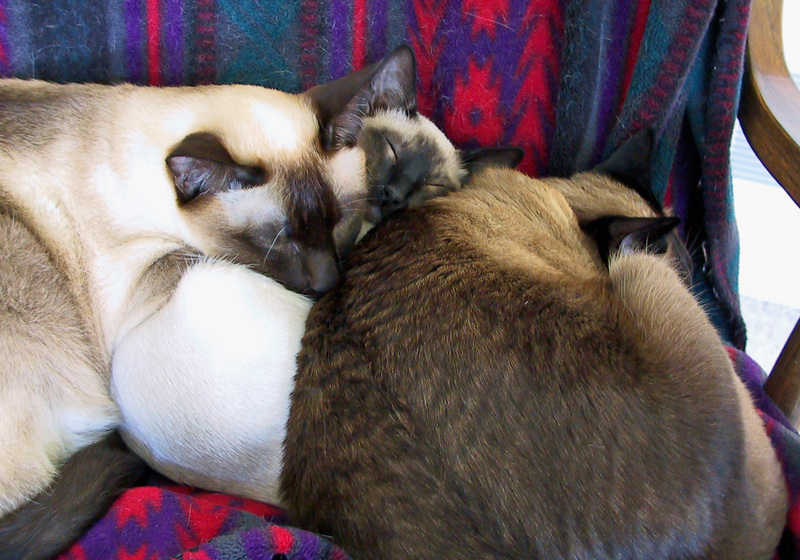 When Cat #2 was dying from cancer, I worried whether I would lose Cat #1 at the same time. Cat #1 always had an above average need for companionship and I didn’t think he’d do well as an only cat. Cat #2 was still somewhat healthy, so we brought home the kitten while there was time for everyone to acclimate. That way, when Cat #2 died, Cat #1 wouldn’t be lonely. Not surprisingly, the other two despised him instantly. However, the kitten came straight from his brothers and sisters and he craved the companionship and warmth of his litter and he was persistent in getting it back. It didn’t take long for the three of them to decide that a pile of cats was the best way to sleep, and I got a number of pictures of them making a kitten sandwich. Cat #2 is on the left and Cat #1 is on the right, ignoring me as I took more pictures. Word for tomorrow – CHUMMY. If you prefer to work ahead, see the list for the week under “A Word A Day”. I’m sorry to hear about cat2. Happy that the kitten pulled everybody together. Animals are great companions, for each other and for us. Not only are they sweet looking angels when they sleep, they also can’t be getting into another round of mischief.� Yes, they do feel safe and secure.� They even had their own chair and blanket to sleep on! They were good boys. I miss them all.